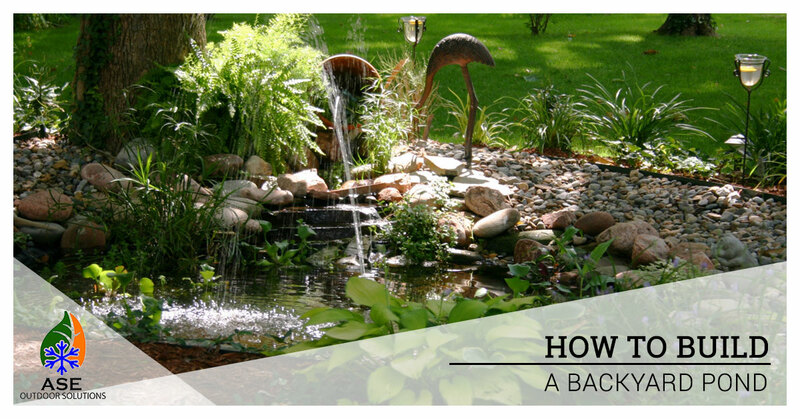 Adding a small backyard pond can be a great way to enhance your backyard. Not only will the sound of falling water add some tranquility to your life, but you can also incorporate some wildlife into your day by stocking your pond with beautiful fish. However, before you start digging a hole in your backyard, it is important to do some research and ensure that you are taking all the right steps. In today’s blog, ASE Outdoor Solutions would like to share with you some tips regarding landscaping and backyard ponds. If you need help creating your outdoor oasis, contact us! We are lawn care and landscaping professionals proudly serving Northeastern Ohio. View our service area, our services, and contact us today to get your free quote. What Do I Need For a Backyard Pond? How Do I Choose Where To Put My Pond? Sunlight — while sunlight is not an absolute requirement, choosing a spot that receives plenty of sunlight (at least six hours a day) will increase your options for plants. Power source — chances are that your pond will require electricity to power the pump and filter. Because of this, you will want to take into consideration the location of a power source when choosing your pond location. Underground lines — stumbling upon a buried pipe or cable when digging is not a good thing. In fact, this can be dangerous and destructive. Prior to breaking dirt, check with your local utilities to ensure that your planned pond won’t interfere with any buried lines or cables. Surroundings — how close is your patio? How many trees are nearby? Will you be able to access the pond from all sides? These are all important things to consider. For instance, if you build a pond in an area that fills up with fallen leaves, this will likely cause your pond to get clogged up during the fall. How Do I Determine The Size Of My Pond? How big do I want my pond to be? This is an important question to ask yourself. To help you answer this question, consider what’s more important — the water feature? Koi fish? Water garden? After you have thought about this, it will then be much easier to determine the depth of your pond. For example, a water garden pond with a simple fountain will only need to be 18 inches or deeper, whereas a koi pond will need to be at least three feet deep. While smaller ponds can be excavated by hand, larger ponds will require professional landscaping assistance and heavier equipment. When digging out your pond, there are a number of options. For example, opting for a tiered, shelf look can be a great way to add some visual intrigue. If you are unsure what would look best in your backyard, contact your local landscapers. After the hole has been dug, you can then add sand and an EPDM liner. Next comes the water pump, filter, skimmer, and any other features you want to include in your pond. To ensure that your pond is safe and operational, you will want to hire a licensed electrician or an experienced landscaper to install all the electrical equipment. After all of this is in place, you can fill the bottom of the pond with rocks and then fill with water. Important note: if you plan on adding fish to your pond, wait at least a few weeks before doing so. This will give your pond time to let the nutrient cycles begin, helping to create a suitable habitat for your new aquatic friends. Looking For Landscaping In Ohio? If you are in the Medina or Summit County area, you need to call ASE Outdoor Solutions. We are a team of landscapers and lawn care professionals with two decades of experience. Whether we are adding a backyard pond, mulching, performing lawn maintenance, or some other landscaping job, we take tremendous pride in our work and in ensuring we meet your individual needs. Why Hire A Professional Landscaping Company? If you love the idea of adding a pond but feel overwhelmed by the idea of doing it yourself, you need to contact your local landscaping company. When you hire professional landscapers to handle your job, you can save time and receive the professional results of seasoned experts. When you partner with our landscaping company, we not only guarantee superior work but also respect, punctuality, transparency, and communication. Contact us today at 330-299-4404 to get your free quote!